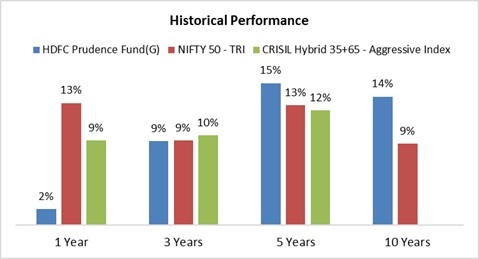 Should you remain invested in HDFC Prudence Fund? HDFC Prudence Fund has the largest AUM of Rs37,998cr as on April 30, 2018, among all equity-oriented mutual funds. The fund started its journey on February 01, 1994, and has given a return of ~18% CAGR since then, as on May 20, 2018. HDFC Growth Fund will merge into HDFC Prudence Fund, and the new fund will be named as HDFC Balanced Advantage Fund w.e.f June 01, 2018, in pursuant to Sebi circulars on categorization and rationalization of schemes. The new fund will be managed by Prashant Jain and there would not be a significant change in its investment strategy despite the new fund will have a mandate to invest 100% in equity and debt. As per Sebi’s new categorization of mutual funds schemes, Balanced Advantage Fund can invest dynamically in equity and debt instruments. Thus, aggressive investors who want to take 75% exposure to equity and 25% exposure debt can invest in the fund to create wealth in the long term. For detailed analyses, investors can read the fund review of HDFC Prudence Fund explained below. HDFC Prudence Fund has the largest AUM of Rs37,998cr as on April 30, 2018, among all equity-oriented mutual funds. 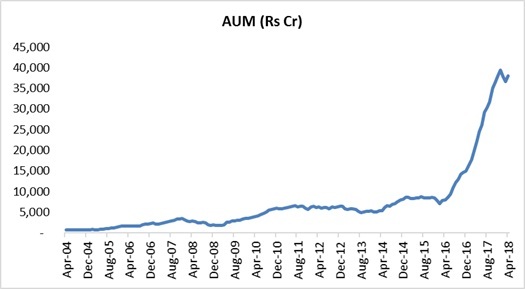 The fund started its journey on February 01, 1994, and has given a return of ~18% CAGR since then as on May 20, 2018. The fund’s AUM has enlarged exponentially after January 2016 as investors, particularly senior citizen, poured money in search of higher regular income as interest rates on fixed-income instruments like FDs had gone down. The fund started paying ~1% dividend yield every month to investors from January 2016 which attracted many investors, particularly regular income-seekers. Besides, the momentum in the Indian equity market also pushed investors to invest in the equity market via mutual funds. Prashant Jain has been managing the fund since June 19, 2003, which indicates a stability in the fund’s strategy. The fund has mandated to invest 40-75% in equity and 25-60% in debt to ensure optimal risk-reward with an aim to prevent/minimize capital erosion. It has been maintaining an allocation of ~75% in equity and ~25% in debt since June 2006. The fund is not a market cap-based, and therefore, the fund manager has a liberty to invest in different stocks depending on their valuation. Prashant Jain is known to take significant bets on stocks and sectors. In April 2008, the fund had the highest exposure to pharma followed by private banks, construction, and industrial equipment. A decade later, in April 2018, the fund had the largest exposure to public banks followed by private banks, IT, and power generation/distribution. Therefore, the fund may underperform for short-term until the bet pays off. In the last one year, the fund has underperformed as public banks, its largest allocation, are underperforming. 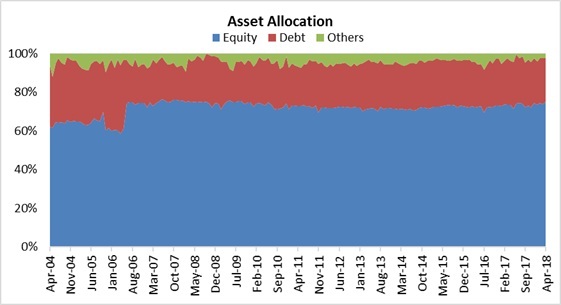 In debt allocation, the fund generally avoids credit bets and duration plays and invests in low-risk debt instruments. The fund’s historical allocations are aligned to its objective to ensure optimal risk-reward with an aim to prevent/minimize capital erosion. Historically, the fund has outperformed its benchmarks, but in recent times, it has been underperforming particularly due to subdued recovery in corporate loan growth and rising NPAs as it has primarily bet on corporate banks. The fund is likely to underperform in the near future as corporate loan growth is still to pick up and NPAs are still rising, though it seems that the cycle is bottoming out. 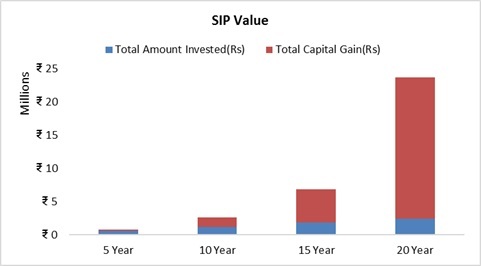 The below table exhibits the value of Rs10,000 per month SIP in HDFC Prudence Fund. An investor would have made Rs2.36cr by investing Rs10,000 per month over 20 years despite various economic cycles. As of April 30, 2018, the fund has the highest exposure to banks, particularly to corporate lenders, which signifies that Prashant Jain is betting on a recovery in corporate loan growth and resolution of high NPAs. Though Prashant Jain bets on a particular sector or theme, he manages the concentration risk by investing in a number of stocks. As of April 30, 2018, there were 81 stocks in the portfolio and the top 10 stocks accounted for only 43% of the allocation. In all, there would not be a significant change in the strategy of HDFC Prudence Funds after its merger with HDFC Growth Fund and subsequent renaming. However, fund manager Jain is known to take bets that can lead the fund to underperform in the short-term. Therefore, aggressive investors who want to take 75% exposure to equity and 25% exposure to debt can invest in the fund to create wealth in the long-term.